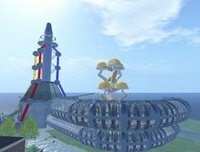 The cable guys have immersed in Second Life as Comcast, alledgedly one of the largest providers of cable services in the US have opened up their island in Second Life. It's an opening we bloggers have been waiting for for several months. 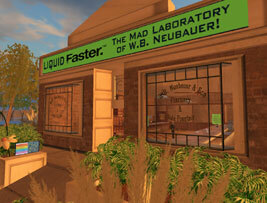 At first look it seems like a chemical-fun factory, largely due to the first building in view, a pharmacy. The enormous racetrack which covers most of the sim would fit in that picture. 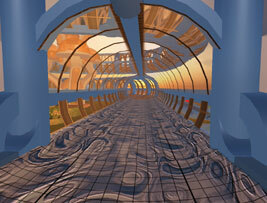 However, after a little discussion we thought the blue pipes might represent a cable streaming fun into our homes.. 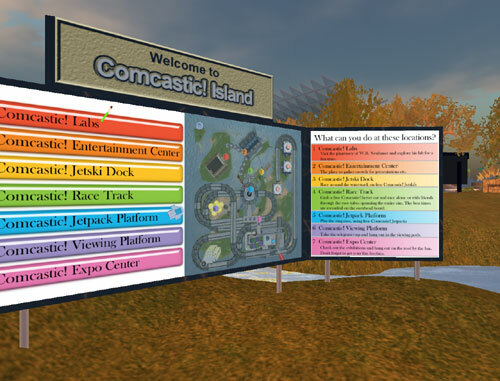 However, according to Millions of Us, builders to this site, it's inline with the comcastic! 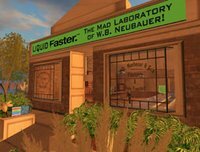 tv ads where they were playing on the idea of a Mad Science Lab where Liquid Faster was created, a sort of 1950's shlocky sci-fi typecast shot in a sci fi lab with vats of bubbly goo. The racetrack caused problems though, as we (Aleister and Me) were unable to rez the jets to enter the tubes (so I looked a little foolish on the tiny version). The live cannonball and jetpacks were easier to control, though the jetski's will give rise to some severe drunk flying. 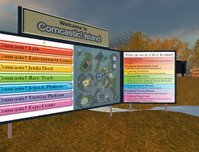 "Comcast are really interested in supporting folks online with efforts like this park - basically, and please understand this is me paraphrasing --offering fun content for folks"
The focuspoint has been on creating the experience, with a subtle touch of branding, and experience there is. Refreshing to see such a circus. And an experience it is as nearly the complete staff of Millions of Us enjoyed the sim's rides in the past few weeks. For the record though, the build is not completely finished yet.